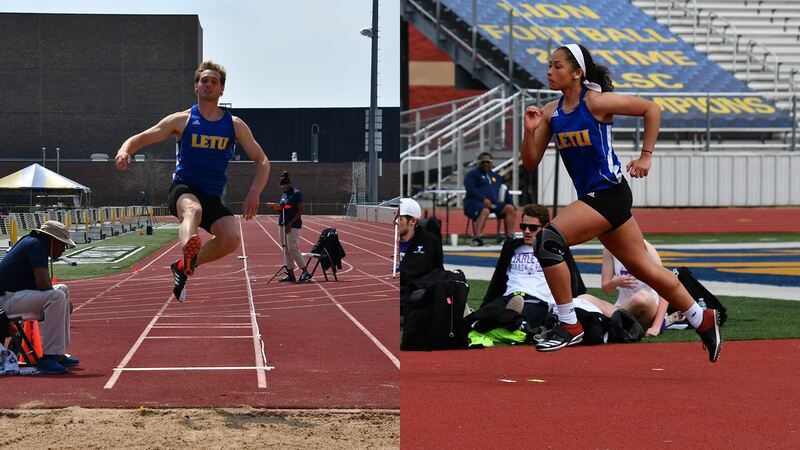 LeTourneau Multi-Events Athletes Get Jump Start On Texas State Invitational. SAN MARCOS, Texas – Getting a jump start on the three-day Texas State University Bobcat Invitational, the LeTourneau University men’s and women’s track and field team would combine to have four student-athletes compete in multiple events. It was part of the day one multi-event portion of the meet hosted on the campus of Texas State University in San Marcos, Texas on Thursday, March 28. Both the men and women competed in half of the scheduled events for their total towards the heptathlon and decathlon, with the other events taking place tomorrow morning to start day two of the weekend extravaganza. The YellowJacket women would have Georgianna Roeder competing on Thursday and putting up times of 18.20 in the 100-meter hurdles and 28.14 in the 200 meters to cap off two of the three running events in the eight-event competition. Roeder would also record marks of 1.43 meters (4 ft. – 8.25 in.) in the high jump and 9.30 meters (30 ft. – 6.25 in.) in the shot put to finish day one with a total of 2,116 points in the heptathlon. On the men’s side, Collin Jones would lead the trio of Jones, Arvin Hrushka, and Keishaun McMillian by taking third place in two of the five events they would compete in. Jones will enter day two with 3,012 points towards his decathlon score after putting up times of 11.36 in the 100 meters and 52.22 in the 400 meters to go along with marks of 6.09 meters (19 ft. – 11.75 in.) in the long jump, 8.39 meters (27 ft. – 6.5 in.) in the shot put, and 1.67 meters (5 ft. – 5.75 in.) in the high jump. Not far behind Jones in the point tally is Hrushka with 2,962 points after times of 12.14 in the 100 meters and 53.95 in the 400 meters to go along with marks of 5.76 meters (18 ft. – 10.75 in.) in the long jump, 10.93 meters (35 ft. – 10.5 in.) in the shot put, and 1.79 meters (5 ft. – 10.5 in.) in the high jump. Competing in the decathlon for the first time would be McMillian who would put up times of 13.37 in the 100 meters, 1:00.51 in the 400 meters, and marks of 6.25 meters (20 ft. – 6.25 in.) in the long jump, 10.46 meters (34 ft. – 4 in.) in the shot put, and 1.67 meters (5 ft. – 5.75 in.) in the high jump to finish with a total of 2,477 points. All four athletes will conclude their multi-event competitions on Friday and will be joined by the rest of their YellowJacket teammates as part of day two of the meet. Twelve more LETU men and ten LeTourneau women will compete on Friday before seeing additional action on Saturday to close out the competition. 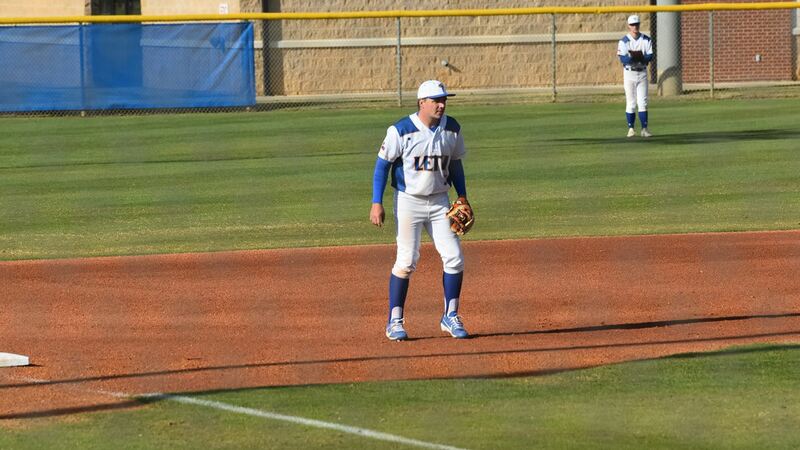 LeTourneau Baseball Doubles Up Gents 8-4. LONGVIEW, Texas – Despite being outhit in the contest, the LeTourneau University baseball team would make the most six walks and five hit batters to double up Centenary College by a final score of 8-4 at Conrad-Vernon Field on Tuesday, March 26. Earning a season-series win over the Gents, LETU is now 15-9 overall while Centenary falls below .500 to 12-13-1. The Gents would look to take an early lead in the top of the first with a one-out single and two stolen bases, but the YellowJackets would escape the jam by getting a strikeout and groundout to strand a runner at third and come away unscathed. Four of LETU’s first five batters would safely reach base in the game as Cody Lee would drive in Lee Hosie and Jacob Jones on a one-out two-RBI single to put LeTourneau up 2-0 after one inning of play before seeing Centenary respond with a run of their own in the top of the second. LeTourneau would wind up stranding a runner in the second and played a scoreless third against Centenary to send things to the fourth where the Gents would use a walk and bunt single to put two runners on. Following a sacrifice bunt to move runners into scoring position, the Gents tie things at 2-2 with an RBI single and execute a double-steal to take a 3-2 lead. The inning would end when Chris Haggar would try to stretch a single into a double as the final out of the inning would be recorded at second before another run crossing home plate to leave the score a one-run margin in favor of the Gents. Wasting little time, LETU would see two quick outs before starting a rally by using a hit batter and error to put the game-tying runner on third for Hosie who would tie things on an RBI single. After stealing second, Hosie would come around to score after snagging two bases on a muffed throw by the first baseman that would have ended the inning as the YellowJackets reclaimed the lead at 4-3 heading to the fifth. LETU added one run in the fifth by seeing another similar scenario play out with a two-out single by Weston McKinley becoming a runner at third following a failed pickoff attempt that allowed McKinley to move to third before scoring on an infield single by Tristan Wilson. The YellowJacket lead would grow again in the sixth as a throwing error on a sacrifice bunt by Jones allowed both Jacob Faubion and Hosie to score and put LeTourneau up 7-3. One more run would be added by LeTourneau in the bottom of the seventh as two walks and back-to-back hit batters with two outs would bring across a runner for LETU to make the score 8-3 as the YellowJackets would be in full control heading to the eighth. Centenary wouldn’t go down without a fight, however, putting the first two batters of both the eighth and ninth innings aboard, but would strand two runners in both innings as only a single run in the ninth would be scored. Earning his first win of the season would be Luke Ludwig who would throw two innings in relief and allow two runs on three hits while striking out two. Jared Schurig would toss 3.1 innings and strike out three while retiring the first nine batters he faced while Kolton Eberlan(2.0 innings) and Ryder Lognion (1.2 innings) also saw action on the mound. Two of LeTourneau’s six hits would come from Hosie as the senior would finish the game two-for-two with a pair of singles, two hit-by-pitches, and one walk. Lee would lead the YellowJackets with two RBI while the six LeTourneau walks would all be drawn by different players. For the first time since March 9, LETU will take on an American Southwest Conference foe when they play host to Louisiana College at 7:00 p.m. on Thursday, March 28. The three-game series was moved up one day to Thursday-Friday due to the potential for adverse weather on Saturday afternoon. 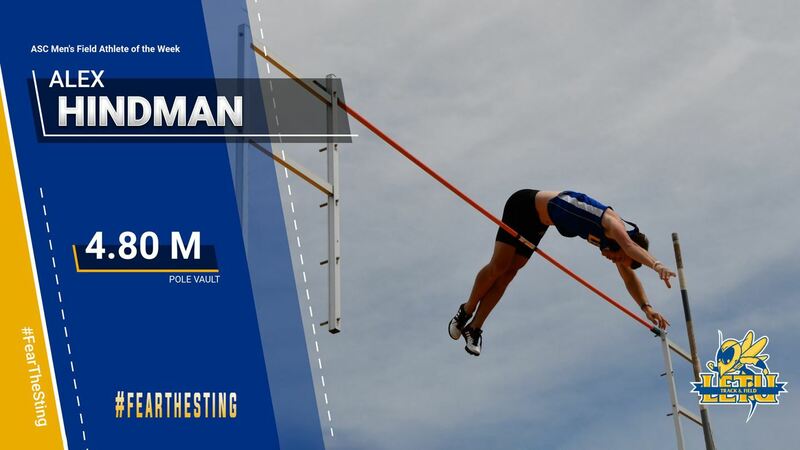 RICHARDSON, Texas – For the third time this season and fifth time in his career, LeTourneau University sophomore track and field athlete Alex Hindman has been named the American Southwest Conference Men’s Field Athlete of the Week for his performance at the East Texas Quad hosted by Texas A&M Commerce on Friday, March 22. Hindman won the pole vault at the meet by clearing 4.80 meters (15 ft.-9 in.) to best the 12-competitor field. The height ranks second in NCAA Division III this outdoor season and is just 0.25 inches from the best mark in NCAA Division III. Katharine Waldthausen Named ASC East Co-Women’s Tennis Player of the Week. 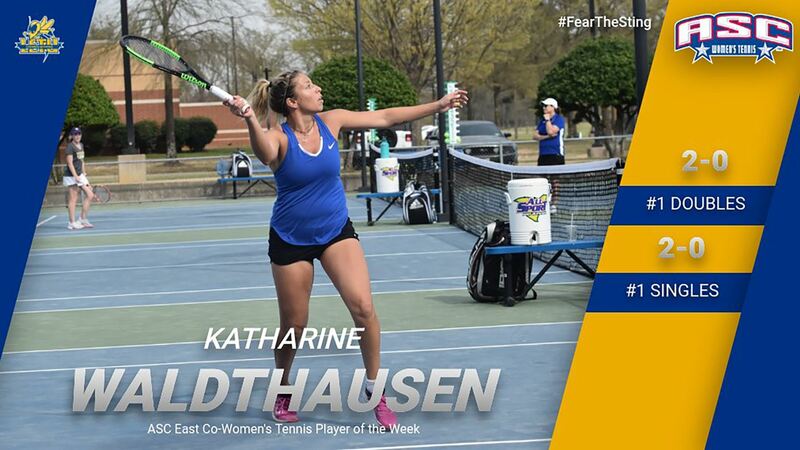 RICHARDSON, Texas- The first time this season and the first time in her career, LeTourneau University senior women’s tennis player Katharine Waldthausen has been named American Southwest Conference East Division Co-Women’s Player of the week for her performances against Concordia University Texas and Texas Lutheran during the week of March 19-25. Waldthausen went 4-0 at No. 1 singles and doubles over the week as she earned a 6-3, 6-0 singles win and teamed with Maddison Brackenreg for an 8-1 victory against Concordia Texas. The senior then played a crucial part in the YellowJackets’ 6-3 road win at Texas Lutheran, posting a 3-6, 6-1, 6-3 singles win and an 8-6 doubles victory. A native of Konigstein, Germany, Waldthausen is majoring in political science at LeTourneau University.